NASHVILLE, Tenn.— The Winter Jam Tour Spectacular, Christian music’s largest annual tour and one of the top first quarter tours in the world, made a series of major announcements during festivities held earlier this evening. Streamed around the world via Facebook LIVE, the event—at Nashville's Hard Rock Café—was attended by artists, industry personnel and national media. 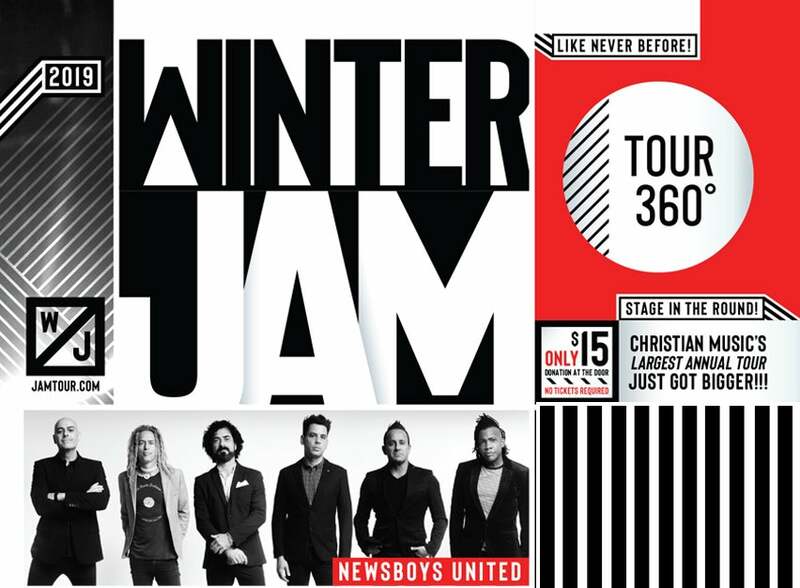 Revealing a history-making tour first, Winter Jam will be presented on a 360º “in the round” center stage, showcasing a diverse lineup helmed by supergroup Newsboys United. “American Idol” finalist Danny Gokey; GRAMMY®-winning recording artist and "Overcomer" hitmaker Mandisa; Northern Ireland's "Count Every Blessing" worshippers Rend Collective; Skillet drummer and female solo rocker LEDGER; GRAMMY®-nominated tour creators and hosts NewSong; and Dove Award-nominated Gotee recording artist Hollyn. In addition, the Pre-Jam Party is slated to feature hip-hop recording artist Ty Brasel; rockers Manic Drive; singer/songwriter Dan Bremnes; and special guest former Stellar Kart and Audio Adrenaline frontman Adam Agee. The tour will also include a Gospel presentation from Dare2Share speakers Greg Stier or Zane Black. Bridgestone Arena in Nashville; and Norfolk, Virginia’s Scope Arena, among numerous other top venues, before concluding March 31 at Cleveland’s Wolstein Center. Jam exploded from a single show in 1995 to become the genre's benchmark tour. country from January through March, boasting 17 sold-out shows.